ROME (AFP) -- Rome’s biggest new building in half a century was inaugurated Saturday, two decades after architects Massimiliano and Doriana Fuksas produced their groundbreaking design for the controversial and much-delayed project. Now that it is finally finished, the husband-and-wife team’s “Nuvola” -- a glass and steel box containing a cloud-like suspended interior -- looks set to join the Colosseum and the Pantheon among the Italian capital’s architectural landmarks. 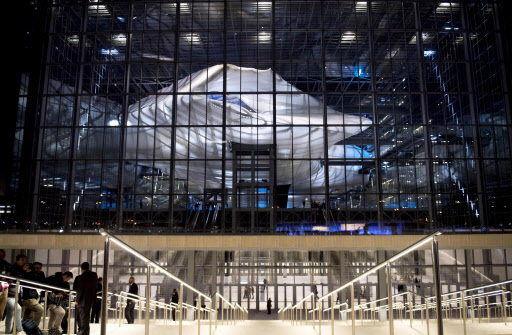 Its name is the Italian word for cloud, but the white, fiberglass-clad interior structure could also be said to resemble a lung or another internal organ. Glimpsed from the outside in twilight it can seem strikingly like an ultrasound scan of an unborn baby. Largely funded by taxpayers, the new building will serve as a convention center capable of hosting gatherings of up 12,000 people. As such, it is also being talked up as a potential game-changer for Rome’s visitor-based economy and EUR, the underdeveloped business district created by Mussolini on the city’s southern edge. Massimiliano Fuksas described the project as the most frustrating of his career, but said he was proud it had been completed as first planned. “We first thought of it in 1995,” the 72-year-old said. “I have been through so many mayors on this project I can’t even remember all their names. While recurring financing problems regularly generated doubts as to whether the building would ever be finished, Fuksas also had to deal with bruising claims over the size of his fees and rumor mill speculation the design was fundamentally flawed. He insists claims he forgot to put any toilets in the first drawings are an urban myth. The architect does confirm, however, that his dealings with local officialdom have left him with no faith in the ability of the public authorities in Rome to manage his masterpiece. Fuksas’s won the competition to build the new center in 2000. But construction did not get underway until 2007 and was repeatedly interrupted due to a combination of red tape and cash constraints. The building was finally completed thanks to additional funds raised last year by the sell-off of four Mussolini-era public buildings. How much it finally cost is a disputed issue. Fuksas says it came in at 239 million euros ($262 million), below the tender price of 275 million euros. Enrico Pazzali, the executive brought in to oversee completion, says the true figure is 353 million euros, but that he is nonetheless confident the Nuvola will prove a worthwhile use of public funds over time. The lingering controversy over that issue was underlined when Rome's current mayor, Virginia Raggi, was heckled at the opening ceremony for suggesting the city had to learn from the mistakes and waste associated with the construction of the “exceptional and imposing” building. The former head of Milan’s hugely successful Fiera exhibition center, Pazzali shrugs off fears that congested, cash-strapped Rome is ill-equipped to cope with an additional influx of visitors. “Our research suggests that convention visitors generate at least twice as much per head as leisure tourists,” he told AFP. “We have the hotels and the Nuvola has the great advantage that it is close to the airport and it is on the Metropolitan (underground rail network). “Our estimates are that the economic benefits to the city and the surrounding area could be between 250-350 million euros a year,” Pazzali said. The Nuvola is the biggest architectural project in Rome since the work for the 1960 Olympics. It l joins a short list of significant contemporary buildings in the city that includes Renzo Piano‘s auditorium, the late Zaha Hadid’s MAXXI museum and the Richard Meier museum built around the Emperor Augustus's altar of peace, the Ara Pacis. For Fuksas, the construction adds to a list of high-profile projects that includes Shenzhen’s airport and Ferrari's headquarters.